The best fish finder for you will depend on exactly how you will be using it. Some people may need a small and light device which is easily transported. Others may require a device with a larger screen and more options. The best choice will be different for different people. Some may choose a fish finder of the highest quality because it is a pastime they take part in often and are very passionate about. Other people may want a cheap and cheerful option as it is something they do for a bit of fun. Then, you will have those that sit in the middle of the two and want the best of both worlds, where functionality and price are both important. If you are kayak fishing, you might want an option which is more portable and light, so you can easy transport it around with you. If you are a serious angler and you enjoy the sporting side of it, you might want an option which gives you the ultimate experience. If you want to record all of your data and view two displays at once, you will probably be looking at an option with a larger screen. So, you know you need a fish finder, but how do fish finders work? They use a transducer to send out a sonar signal under the water. When this signal reaches an object, such as the floor or a fish, the sonar wave estimates the size of that object and the depth. The sound wave is returned to the fish finder as an echo. This information is fed back to your device, and a picture is created on your screen. This image enables you to see what is beneath you. The image you see on your screen will show you how many fish are down there and how far away they are from you. They will also show you objects in the water other than fish, so you will be able to see any hazards coming your way. They can show you items in the water, such as logs or rocks and alert you to shallow water. Some devices can also show you the temperature of the water so that you can fish as efficiently as possible in that area. Fish finders are an incredible hand tool for the modern angler, and technological advancements mean these devices are getting better and better. Display clarity and quality are increasing, and the software packages are better. You are getting more and more for you money when you invest in a fish finder. Hummingbird fish finder reviews tell us this device is top-notch and one of the best options out there. It boasts a 10.1-inch color display, which is backlit and LED. The impressive size of the screen makes it easy to read and interpret. The display gives you bright and clear images, and it can still be easily read in the sunlight. This device is hugely advanced, and the tech spec is incredible. It comes equipped with down imaging sonar and Dual Beam Plus. This Hummingbird fish finder transducer not only looks directly down; it also scans the surrounding area too. The coverage of the second beam is at 60 degrees and expands your coverage to an area equal to your depth. The GPS will tell you how fast you are traveling and you can track and plot using GPS too. You can view charts in 3D and keep track of the water temperature as well. You can track your route and see waypoints as you are moving. As the screen is so large, you can view it in split screen mode. This enables you to display more than one visual at a time. There are a great number of optional add-ons to increase the functionality of this device even further. It is quite a pricey device, but you get plenty of “bang for your buck”, with this luxury option. The Lowrance is another very high-quality device. The display is touchscreen, and there is also the option to use the keypad to navigate the device. The interface has been updated with this model, making navigation using the touchscreen much easier. The screen is 7 inches and uses a backlit widescreen display, and the image clarity and quality are amazing. This device uses CHIRP sonar and StructureScan HD simultaneously, to give you the best view of what is beneath and beside your boat. The Lowrance also has integrated wireless connection with the GoFree app which you can download on your smartphone. You can download Insight maps from the app as and when you need them, while you are on the go. 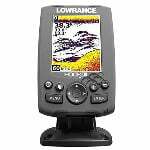 Lowrance fish finders GPS is an internal antenna providing highly accurate positioning. There are built-in charts for coastal and inland water in the US, allowing you to navigate the area you are in easily. This device is quite advanced, and it can take a little time to get the hang of it, and sometime before you use it to its fullest potential. But if you are looking for a top of the range option and you don’t mind paying a little bit more, you should be keeping this in mind. Lower in price than the other two, the Raymarine Dragonfly 7 Pro still offers a great user experience. The device uses wide spectrum CHIRP sonar technology to give greater detail. It also uses CHIRP DownVision to provide you with an amazingly clear image of what is beneath you, up to 600 feet down. The device comes with built-in GPS and Navionics+, allowing you to easily navigate around and pinpoint your location. It has integrated wifi so you can stream your sonar data to your smartphone or tablet, live. You can do this by downloading the Raymarine Wi-Fish app and connecting. The display is 7 inches, and the LCD screen is optically bonded, so it stands up to all weather. If you take a look at a Raymarine dragonfly review, you may have seen that the menus can be a bit slow and less responsive than expected. The Raymarine software update appears to have fixed this issue, and everything is as fast as it should be. 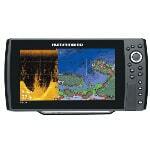 The Humminbird gives you a 5-inch screen, with a color display that is backlit. This fish finder uses CHIRP sonar to give you a more detailed view of the water beneath you. 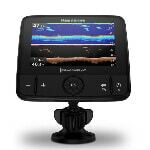 This side imaging fish finder helps you see more of what is going on around you and gives you a better view of the fish you are trying to locate. Side imaging sonar enables you to gain a 180 degree perspective of the water beneath you. 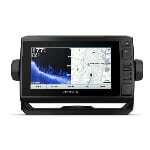 There is internal GPS Chartplotting which allows you to precisely locate and navigate. It also has built-in UniMap cartography, showing you the coastline, lakes, and rivers in the US. There is a MicroSD card slot which you can use to save screenshots and sonar recordings. 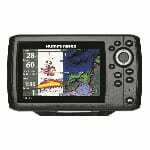 The buttons aren’t backlit, and there are some people who don’t consider the maps to be up to scratch, but it is still one of the best GPS fish finders. 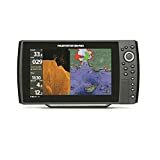 This Humminbird portable fish finder comes in at under $300, and for a great device like this, that isn’t too shabby. The screen is 5 inches, and the WVGA display is the color with excellent clarity. You may view in split screen mode so that you can see two displays at once. This device uses CHIRP Dual Beam PLUS sonar to give you the best possible view of the water beneath you, by sending out two waves of sonar. The precision internal GPS provides you chart plotting and built-in Anima cartography. There is a MicroSD card slot, allowing you to add optional maps and save waypoints, so you can easily navigate to your top spots again. It is easy to install and gets excellent reviews online. Hardly anyone has a bad word to say about this product! 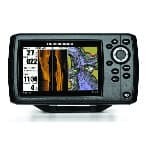 This Garmin GPS fish finder is simple, easy to use and easy to install. It has an auto-dimming display and a backlit keypad, making it easy for you to see in the light and dark. You can get this 4 inch and 5-inch square displays, and 7 inch and 9-inch widescreen displays. This device uses CHIRP sonar, giving you the best view beneath your boat by sending out a continuous sweep of frequencies. It is also equipped with DownVu scanning sonar. The device comes with built-in maps and charts, so you can easily navigate around. The LakeVu HD maps are preloaded and show 17,000 lakes in total and 13,000 HD lakes. Its internal GPS accurately updates your position, meaning you can mark your waypoints and return to them with ease. 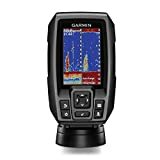 Again, this fish finder gets great reviews, and hardly a bad word is said about it. 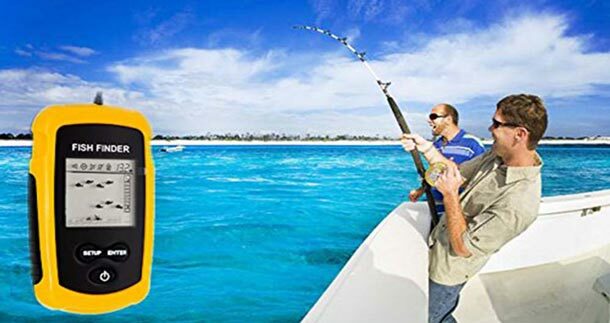 This fish finder is easily connected to your smartphone using wifi and is compatible with both iOS and Android devices. The Deeper Smart portable fish finder connects to you phone allowing you complete freedom of use. It is small and light, and it can be easily transported anywhere with you. 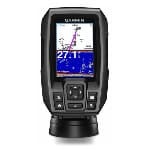 The Deeper Smart sonar fishfinder has a great connection range (up to 330 feet) in comparison to other portable options on the market. This device is designed to float in the water and scan the depths. 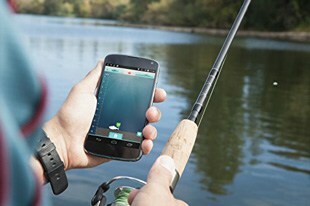 It measures depth, temperature, bottom structure and marks fish, then streams all this information to your smartphone. One of the obvious downsides to this castable GPS is that you have to use it in conjunction with your smartphone. This can be hazardous as if you are using it on a kayak, for example, it is easy to drop your phone in the water. If you use fishing as a way to get away from the technical pressures of life like social media, this option isn’t for you. This little fish finder for a kayak is compact and versatile and is rewarded with great reviews online. It is very reasonably priced, and you get a great product for your money. Garmin has focused on keeping this device simple and easy to use. The display is a compact 3.5 inches, and the display is color, so you can easily interpret the information. There is built-in high sensitivity GPS, and you can easily mark your hotspots on the waypoint map and return to them later. There aren’t full maps setting on this device, but that is to be expected for the lower price. This fish finder uses CHIRP sonar to give you an accurate display of the water below your boat. The fish finder transducer can be upgraded to high-performance CHIRP with a GT8 or GT15 transducer for an additional fee. This device is portable and can be taken anywhere with you, increasing your flexibility. 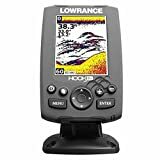 This Lowrance sonar device is one of the cheapest on the market, at less than $100. For your money, you get a 3-inch color display, with a screen that is easy to see in bright sunlight and wide viewing angles. The dual frequency option helps you maximise your viewing. The 200 kHz frequency option gives you up to 20 degrees of conical coverage. The Lowrance side scan sonar 83 kHz option allows you all the way up to 60 degrees of coverage. Using the buttons on the device, you can quickly switch between the two different frequency options depending on the situation. The transducer has a built-in water temperature reader to help you fish more efficiently. The Lowrance side imaging sonar receives mixed reviews, with some users finding it works great and others having a different experience. If you are purchasing a unit for under $100, it is never going to work like a 500 dollar unit. The display isn’t going to be anywhere near as detailed, and there aren’t going to be a tonne of options for you to make use of. But if you want a cheap and sturdy device, this Lowrance option is great. The Hawkeye portable fish finder is a great little handheld device. The VirtuView Dot Matrix display affords easy visibility and allows you simplistic viewing at a glance. The dual frequency FishTrax Intelligent sonar lets you easily see the fish beneath your boat by sending out signals and listening for the return. You can use this device to detect the depth and location of fish and look at the structure of the ground beneath you. This light and the versatile fish finder are one of the best portable fish finder options out there. As well as it is a portable device, it can be easily mounted to your boat so that you can use it anywhere and everywhere. The water temperature gauge will assist you with getting the best out of your fishing time. 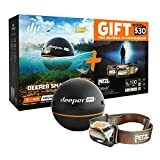 This little fish finder does exactly what it says on the box and is a brilliant option for beginners. It is a cheap device, which is easy to use and is perfect for getting you started. As with the other more affordable options, the capability is limited, but this is still a great device. Whichever fish finder you choose, it will help you achieve your fishing goals. Whether you are just looking to have a bit of fun, or engage in the sport more seriously, there is a device out there for you. If you want to spend big and get yourself set up with a serious bit of kit to seriously pursue your love of fishing, you will be looking at one of the more pricey options. If you want to stay connected on social media and post regular updates on your progress and your best catches, you will want a fish finder with Wi-Fi connectivity and an app. If you don’t get out on the water that often and are looking for a lower priced device that does what is says on the tin, one of the cheaper options on this list will be perfect for you. 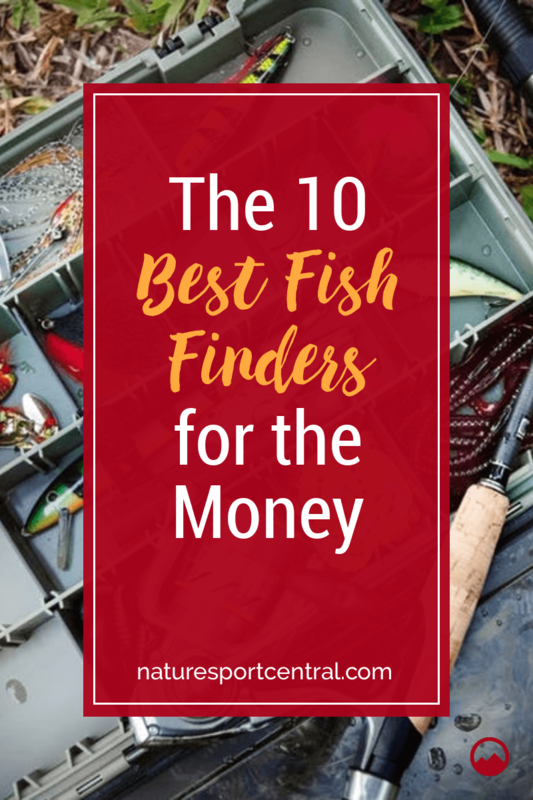 Whichever type of fishing you are going to pursue, whether it’s for sport or relaxation, there is a fish finder on this list for you.